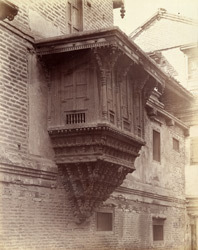 Photograph of a carved wooden balcony window with richly carved corbelling at Sidhpur in Gujarat, taken by Henry Cousens in the 1880s, from the Archaeological Survey of India Collections. Wood carving on house facades was prevalent in Gujarat. The decoration is generally concentrated on the upper storey, with the ground floor left relatively plain. In the 'Archaeological Survey of Western India, vol. IX', Burgess and Cousens wrote, "Gujarat, as already remarked, is full of examples of artistic wood-carving applied to the decoration of house fronts; and in a bye street, behind the mosque and not far from the Rudra-Mahalaya, there projects from a very dilapidated wall, a beautiful specimen of this kind, in the form of a balcony window."